Oggi in una conferenza stampa abbiamo presentato il nuovo Rousseau all’Associazione Stampa Estera, vogliamo farlo conoscere a tutto il mondo e per questo abbiamo realizzato un video (pubblicato in anteprima dall’Huffington Post World) in inglese che spiega come è nato, come funziona e qual è la filosodia di Rousseau. Di seguito trovate il testo sia in inglese sia in italiano. Vi invitiamo a condividerlo con i vostri amici sparsi per il mondo affinchè tutti conoscano questa eccellenza made in Italy che ha come obbiettivo la massima partecipazione dei cittadini alla vita democratica del Paese. 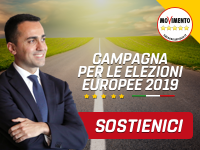 Invitate i vostri amici a iscriversi: puntiamo al milione di iscritti entro la fine del 2018. Non delegare, partecipa! In Italy we did it. 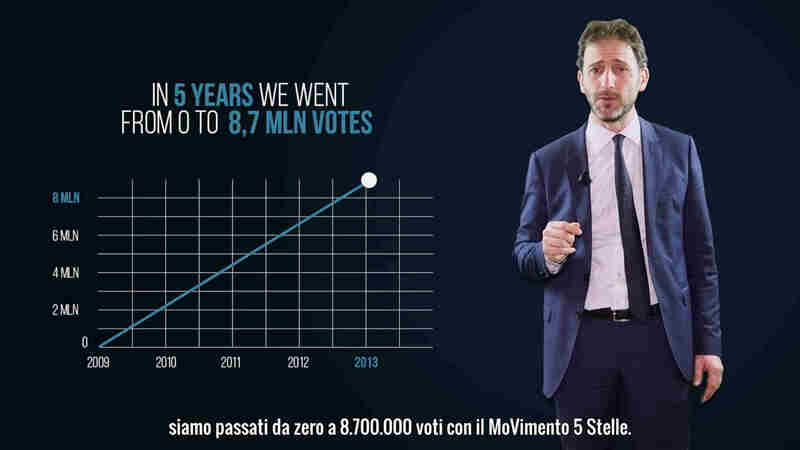 We used the Internet and in four years we went from 0 to 8.700.000 votes with the Five Stars Movement. And today we have over 2.200 people elected in around Italy with the 5SM. And among these we have over 130 members of Parliament, 15 members of the European Parliament and 36 mayors of various towns around Italy like Rome, Turin, Livorno, Ragusa and many others. The representative democracy was probably the best model that we could have until a few years ago. But with the use of the Internet and the set of tools that can be used through the Internet, today participation is probably the best democracy that we can have. In Italy, we did exactly that. We used the set of tools online that today go under the name of Rousseau and through these tools today over 140.000 people are actively participating in the life of the 5SM. The name of Rousseau comes from Jean-Jacques Rousseau, a famous French philosopher that thought that if you want to know what people think you have to ask them. And that’s exactly what we do with the 5SM and with the Rousseau application. We get people to participate, we get people to tell the Movement in which direction it needs to go and which people should be elected. Our first application is Vote. People can actually decide who will finish up in the list of the 5SM. For example in the European elections we had 87.000 people that could candidate themselves and five thousands of these actually came forward and decided to publish their CVs, their video, and all information about them to describe them and to describe the intent for the 5SM. 73 of these actually finished up in the list. Today we have 15 members of the European Parliament that actually stand for the 5SM, that came from those 87.000 people that could actually come forward and decide to candidate themselves. The same application for example was used for Rome, where over 10.000 people could actually candidate themselves. 200 actually did and today we have 29 city counselors and we have the first female Mayor of the Capital. Once elected, the 5S Members of Parliament are obliged to discuss what they’re doing online directly with the people that are actively using Rousseau. For this application named Lex, Law in Latin, we have today 250 laws in discussion with over 80.000 comments and integrations and amendments by the people that are part of the 5SM. This is an example of how laws in Parliaments get presented with the 5SM. No delegation, participation! Get people participating in the law-making. When laws become more complex to discuss we have a longer system that allows us to arrive to design a complex law, using the Internet, the votes and participation. For example, in 2014 we discovered that our electoral law was unconstitutional. So the 5SM had to propose an electoral law of its own. We discussed in three months online what was the best model that we should adopt in Italy and we did that getting a University professor to explain all the main points of the electoral law and we got people voting on all the main points of the electoral law and in which direction we should go and we defined after three months of discussions and votes online the electoral law proposed by the 5SM. That’s the way we are actually designing the government program for the next elections. We’re doing it online, getting people participating and voting online. But what happens if someone wants to propose a law to the representatives that we have in parliament? Well, we thought about that, too, and today we have Lex Iscritti: that’s another application that allows people to propose their law and, if voted by all the others, that will be taken to Parliament and the person who proposed it will actually go physically in Parliament to write it out with the staff of the 5SM and present it in Parliament. Today we have over 5.000 laws already proposed by people and twelve of these have already been taken to Parliament. The Internet can also be used to organize people and for the people that are elected, for example, in the 5SM, we have developed a system so that they can share what they do in their town council or in Parliament or wherever they are working with all the others, so people in another town council for example can see what has been done in the nearby town and copy it, for example, if they think it’s a good idea. To go in the political arena, you need to know things and for that we created an e-learning platform. So for example the new people elected in their town council today have a course dedicated to them to know everything they need to acknowledge to enter the town council. And on this e-learning platform all other candidates, all other experts participating in the 5SM can create courses to allow everyone to share their knowledge. Last but not least, there’s Activism, a set of applications that allow people to participate locally on local battles and local activities that the 5SM is organizing. By the way, all this is financed with microdonations; no public money because in Italy, Italians decided through the referendum in the nineties not to give public financing to parties. Parties after that decided it was not called “public financing” anymore but it was called “reimbursement“. For example, at the political elections in 2013 we obtained about 700.000 euros with microdonations of 30 euro each and we spent about half of that; the other half went to an earthquake city, a town school that was destroyed by the earthquake. Having obtained 8.700.000 votes, that converts to roughly 4 cents spent per vote. In the reimbursements that we were entitled to, we were entitled to 4,87 euros. That’s more than 100 times what we actually spent and they call them reimbursements! So we said no to 42.000.000 euros we were entitled to just because to us referendums still mean something. Don’t settle for delegation, choose participation. It’s possible, in Italy we did it, with the 5SM and Rousseau. In Italia ci siamo riusciti: attraverso Internet, in quattro anni siamo passati da zero a 8.700.000 voti con il MoVimento 5 Stelle. E oggi abbiamo oltre due 2.200 membri del MoVimento eletti in tutta Italia. E tra questi abbiamo oltre 130 parlamentari italiani, 15 membri del Parlamento europeo e 36 sindaci di diverse città italiane, tra le quali Roma, Torino, Livorno, Ragusa e molte altre. La democrazia rappresentativa è stata probabilmente il miglior modello che potessimo avere fino a qualche anno fa, ma grazie a Internet e agli strumenti che si possono utilizzare attraverso la rete oggi la partecipazione è probabilmente la migliore democrazia che si possa avere. Ed è proprio quello che abbiamo realizzato in Italia: grazie agli strumenti della piattaforma online che porta il nome di Rousseau, oggi oltre 140.000 partecipano attivamente alla vita del MoVimento 5 Stelle. Il nome “Rousseau” è un omaggio a Jean-Jacques Rousseau, famoso filosofo francese che riteneva che se si vuole conoscere il pensiero del popolo è necessario chiedergli cosa pensi. Ed è proprio quello che noi facciamo con il MoVimento 5 Stelle e con Rousseau: stimoliamo le persone perché partecipino, perché dicano al MoVimento in quale direzione deve muoversi e chi eleggere. La nostra prima applicazione è Vota: le persone possono realmente decidere chi entrerà a far parte delle liste del MoVimento 5 Stelle. Ad esempio, alle elezioni europee avevamo 87.000 possibili candidati e 5.000 di essi si sono effettivamente presentati, pubblicando online i loro curricula, i loro video e tutte le informazioni sulla loro persona e sulle loro intenzioni rispetto al MoVimento 5 Stelle. 73 di essi sono effettivamente entrati nella lista. Oggi il MoVimento 5 Stelle è rappresentato al Parlamento europeo da 15 membri, che provengono da quegli 87.000 possibili candidati. La stessa applicazione è stata utilizzata, ad esempio, a Roma, dove oltre 10.000 persone avrebbero potuto candidarsi. In duecento l’hanno fatto e oggi abbiamo 29 consiglieri comunali e il primo sindaco donna della Capitale. Una volta eletti, i parlamentari del MoVimento 5 Stelle sono obbligati a discutere online del loro lavoro con gli utenti di Rousseau. Attraverso questa applicazione, Lex (Legge, in latino), oggi abbiamo 250 leggi in fase di discussione, con oltre 80.000 commenti, integrazioni e modifiche da parte dei membri del MoVimento 5 Stelle. Questo è un esempio di come il MoVimento 5 Stelle arrivi a presentare le leggi in Parlamento. Non delegare, partecipa! È necessario mettere le persone in condizione di partecipare ai processi di legiferazione. Quando le leggi si fanno più complesse per la discussione, ci avvaliamo di un sistema più articolato, che ci consente di arrivare a elaborare leggi complesse attraverso Internet, i voti e la partecipazione. Ad esempio, nel 2014 abbiamo scoperto che la nostra legge elettorale era incostituzionale. Il MoVimento 5 Stelle doveva pertanto proporre una propria legge elettorale. Abbiamo discusso per tre mesi online per trovare il modello migliore da adottare in Italia e l’abbiamo fatto chiedendo a un docente universitario di spiegare i punti principali della legge elettorale e chiedendo alle persone di votare tutti i punti principali della legge elettorale e di definire le mosse future: dopo tre mesi di discussioni e voti online, è nata la legge elettorale proposta dal MoVimento 5 Stelle. In questo modo, stiamo di fatto definendo il programma di governo per le prossime elezioni, stimolando le persone a partecipare e votare online. Ma che cosa succede se una persona vuole proporre una legge ai nostri rappresentanti in Parlamento? Abbiamo pensato anche a questo e oggi abbiamo Lex Iscritti, un’altra applicazione che consente alle persone di proporre le loro leggi che, se votate da tutti gli altri, saranno portate in Parlamento. La persona che propone la legge andrà fisicamente in Parlamento a scriverla con lo staff del MoVimento e la presenterà. Oggi abbiamo oltre 5.000 leggi di iniziativa popolare, 12 delle quali sono già state portate in Parlamento. Internet può essere utilizzato anche per organizzare le persone, ad esempio abbiamo sviluppato un sistema che consente alle persone elette con il MoVimento 5 Stelle di condividere quello che fanno nei loro consigli comunali o in Parlamento o ovunque stiano lavorando, così altre persone in altri consigli comunali potranno trarre ispirazione dalle loro iniziative, se le ritengono meritorie. Per partecipare all’arena politica, devi essere informato e proprio per questo abbiamo creato una piattaforma di e-learning che consente, ad esempio, alle persone appena elette in consiglio comunale di seguire un corso dedicato, per apprendere tutto quello che devono sapere per entrare in un consiglio comunale. E su questa piattaforma di e-learning tutti gli altri candidati o gli esperti che partecipano alla vita del MoVimento possono creare corsi, di modo che tutti possano condividere le loro competenze. Ultimo, ma non per importanza, Attivismo, un set di applicazioni create per consentire alle persone di partecipare a battaglie e attività locali organizzate dal MoVimento 5 Stelle. A proposito, tutto questo è finanziato attraverso micro-donazioni; non utilizziamo denaro pubblico perché con un referendum, negli anni 90, gli italiani hanno votato per l’abolizione del finanziamento pubblico ai partiti. Dopo tale risultato, i partiti hanno deciso che non si sarebbe più chiamato “finanziamento pubblico” ma “rimborso”. Ad esempio, alle elezioni politiche del 2013, abbiamo ottenuto circa 700.000 euro attraverso le micro-donazioni da 30 euro ciascuna e ne abbiamo spesa solo la metà; l’altra metà è stata donata per la ricostruzione di una scuola di una città distrutta dal terremoto. Avendo ottenuto 8.700.000 voti, la cifra corrisponde all’incirca a 4 cent. spesi per voto. Il rimborso a cui avevamo diritto è pari a  4,87 per voto, ossia oltre 100 volte quello che abbiamo speso: e lo chiamano “rimborso”! Abbiamo detto no a 42.000.000 euro a cui avevamo diritto, perché i referendum per noi hanno significato. Non accontentatevi di delegare, scegliete di partecipare! È possibile, in Italia l’abbiamo fatto, con il MoVimento 5 Stelle e Rousseau!